There are a handful of campaigns that have topped the wish lists of Panzer Grenadier fans for years. We’ve provided most of these: Kursk, France 1940, the fall of Berlin. One of the most anticipated has been the U.S. Army’s role in the desert war. 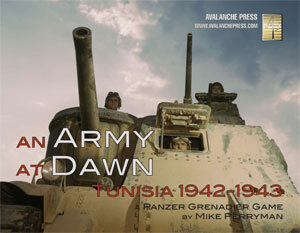 An Army at Dawn covers not only the American campaign in Tunisia, but also includes the Vichy/Free French (same guys, different sides), British, Germans and Italians. With those rules, you can play 40 scenarios, all designed by Mike Perryman, designer of many Panzer Grenadier games including Burning Tigers and Liberation 1944. There’s a very nice mix of scenarios this time out: the Americans fight the French, the Germans and the Italians. The British fight the Germans and Italians, but not the French. The French fight the Americans, Germans and Italians. The Italians and Germans fight everyone except each other. The campaign begins with Anglo-American landings in Algeria, resisted by the French garrison there. The Americans and British quickly press into Tunisia, where they meet the Germans and Italians. The Axis are much more skilled in armored warfare than the Americans, who aren’t helped any by their shoddy equipment (37mm anti-tank guns and halftrack-mounted “tank destroyer” low-velocity 75mm, fielded well after these weapons have been shown inadequate in Egypt and Russia). But eventually the Axis are pressed back into an ever-tightening bridgehead, even as they continue to put up fierce resistance. As with most Panzer Grenadier games, the scenarios have a wide scope. There are tank battles, like Kasserine Pass. There are close-quarters infantry fights, and combined arms clashes. 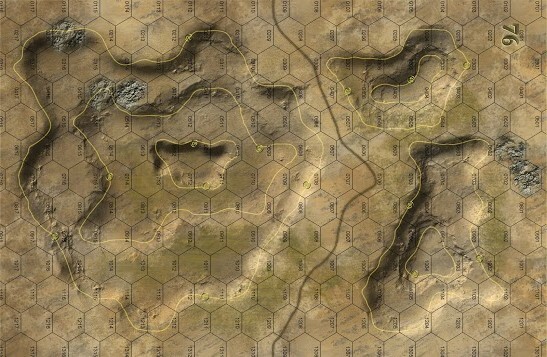 Most of the scenarios are what I’d consider mis-sized; six of the 40 use one mapboard, but only one uses all four. All of the rest use two or three. The maps themselves are Guy Riessen desert specials, very similar to 1967: Sword of Israel’s maps in look and content. There’s only one town among the four boards, and a lot of hills and rocky ground. Tunisia is a very lonely place. And on those hills will go a wide array of units. The game is built around the confrontation of the U.S. Army’s II Corps and the German Fifth Panzer Army, with smaller roles going to the British First and Eighth Armies, Italian First Army and French XIX Corps. And that’s how the mix of pieces works out, with most of them American and German, and smaller numbers of Italians, British and French. The American forces suffer somewhat from President Roosevelt’s decision to ship the very best new equipment to the British. So although the M4 Sherman tank had already seen combat with the British at Alamein, the American 1st Armored Division went into action with the inferior M3 Lee. Other crapulent American weaponry includes the 37mm anti-tank gun (the 57mm gun, actually capable of knocking out German tanks, was available but not issued), the M6 tank destroyer (the useless 37mm gun mounted on a Dodge truck; the M10 tank destroyer with a potent 3-inch gun on a Sherman chassis had begun production in September), and the T12 half-track tank destroyer mounting a license-made French 75, a fine weapon when introduced in 1897 (see preceding). The M10 and the M4 Sherman do finally make an appearance in the later scenarios, though by this point the Germans have the Panzer IVH with its tank-killing long-barreled 75mm gun and the awesome Tiger tank. American infantry is well-armed, and their machine gun platoons are very potent, but these are very raw troops and their leadership, morale and initiative are seldom very good. While the Arsenal of Democracy has failed its ground troops, this is the United States of America we’re talking about here. That means they have plenty of air power to back up the troops, and pretty awesome off-board artillery. They’re going to need both of them. Among the minor players, the Italians are actually pretty good, with a lot of high-morale Bersaglieri present and only their most modern tank, the M14/41. Which is still not all that good, but when the Americans are shooting at it with their noodle-firing 37mm guns, it will suffice. Against the tiny British contingent, the Italians don’t look so bad, but at least the Brits have a workable anti-tank weapon (just one) with their six-pounder. The French, on the other hand, are kind of pitiful, with weak infantry, no armor and limited support weaponry, though their leadership is surprisingly good (as befits units of long-service professionals). The pieces themselves are the new-style silky-smooth die-cut pieces we’ve started using. There’s very little die-cutting damage on them. Since there are no tell-tale smash marks to help you tell the front from the back, we’ve added a thin stripe back there to help with that. These are very fine game pieces, and you’ll enjoy playing with them. All of the Fourth Age games are really nice packages; the color play-aids really do make a difference and the new-style pieces on the fine Riessen maps are just fun to play with. Click here to order this great game. Click it now.